The passing of Keith Floyd earlier this month caused me to dig out one of his old cookbooks, Floyd on France, a cornerstone of the Floyd canon and packed full of traditional French recipes described and executed with typical flair. Beef Bourgignon, caught my eye. It is, as Floyd puts it ‘a splendid stew (that) has been raped and pillaged by pub and wine bar cooks the length and breadth of this fair land of ours – they add peppers and other unmentionable ingredients to what must be a simple, slow-cooked dish with no deviation from this recipe’. First, open a bottle of very good quality red wine, pour a glass and place it next to the stove. No Keith Floyd recipe should be cooked without a glass of red wine within arms reach. It’s just not the done thing. Cut 1.5kg of well-hung shin beef into chunky dice. The quality of the beef is vital, and I was lucky enough to have some shin from an Aberdeen Angus steer, dark, almost purple meat marbled with fat. The butcher was, quite rightly, proud to have it and made sure I left his shop under no illusion about the quality of my beef. Place the meat in a large bowl and add five roughly chopped onions, five roughly chopped carrots, five roughly chopped shallots and three cloves of garlic, along with six large sprigs of thyme, two bay leaves and a handlful of chopped parsley. These vegetables are vital to the marinade, giving it body and complexity. Cover the meat and veg with red wine, a good Burgandy is ideal. Keith stipulates the use of two bottles, but one topped up with a little water was enough. Don’t worry, there’ll be more booze later. Allow the meat to marinade in the fridge overnight, the longer the better. The next day, quickly brown six thick slices of cubed streaky bacon in a large, heavy bottomed pan with little oil and then add the meat, leaving the vegetables to one side and reserving the marinade separately, stirring to brown. This is best done in small batches. Be careful not to burn the bacon. Sorting the meat from the veg is reasonably laborious, but the veg has done its work in the marinade. There’s still life in the veg yet, and I made a half decent soup out of it, adding some bouillon and simmering for twenty minutes before liquidising. Quite a nice lunch. Next add a large glass of brandy and flame it, followed by 150ml of Madeira and enough of the marinade to cover. Bring the stew to a gentle simmer, cover and keep it on a low heat for three hours, until the meat is tender and the sauce thick. Stir it every now and again and top up the marinade if it starts to reduce too much. When the meat is cooked, fry 250g of chopped mushrooms in some butter and add them to the stew. Fry 200g of small, baby onions until they start to colour and add these as well, simmering gently until the onions are cooked through. Season with salt and pepper and serve with crusty bread and French beans. The meat will be tender to the point of falling apart, deeply flavoured with the wine with sweet overtones from the Madeira and brandy. It’s extremely good, and tastes of France. I cooked this meal as part of Back to the Chopping Board and A Slice of Cherry Pie‘s excellent joint idea to encourage people to cook Keith Floyd’s food in his memory. If Keith Floyd did one thing, he encouraged us all to cook better, and that’s a good legacy to leave behind. Keith Floyd sounds like an inspiration to all of us foodies. I must look for his cookbook. The beef bourgignon sounds incredibly delish! I've done Julia's so will need to give this a whirl. Very delicious and interesting. though i dont understand french, it seems to be a fun video to watch. your beef stew looks delicious! I watched the doc on TV just before he passed away. Very sad, we're big fans of Keith Floyd and his 48 clove of garlic chicken is a regular dish in our house. I am so glad you posted this! I always try to catch as many of his programs as possible! Love the way you described the recipe as he would! HE WIll be missed! Oh and just atched the video too! LOL so funny, bless him! Haha, love that clip. This is a great dish and it looks fantastic. Thanks for entering. Thank you for taking part. One of Floyds classics! 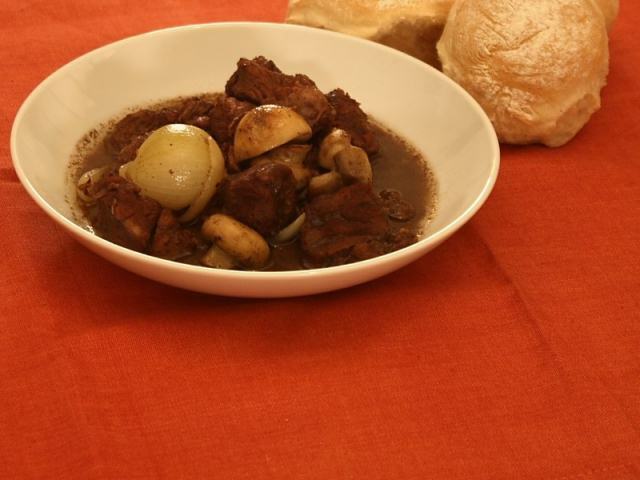 Bourgignon is a family favourite – my husband makes a good one, but I have to say Floyd's recipe sounds better! And as for the wonderful-sounding meat you used… yum! That looks and sounds fantastic. Great job. I’ve cooked this recipe twice now, both times in France, once for my older brother and once for my younger brother. It is awesome, and always enjoyed. In both cases I referred to this website for the recipe. Didn’t get wine on the iPad the second time.